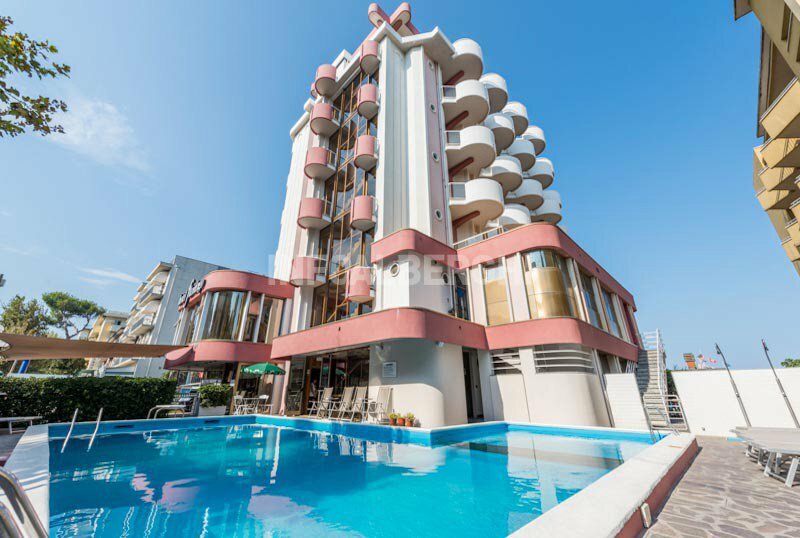 In Rivazzurra di Rimini, with direct access to the sea, the Flamingo Hotel is a 3-star family-run hotel with comfortable and elegant rooms, a swimming pool with a children's corner and a sea-view restaurant. Animals are not allowed. The hotel is located on the Rivazzurra seafront, a tourist area south of Rimini, not far from Riccione. The property has direct access to the beach and is within walking distance of the promenade with shops, clubs and restaurants. A short distance away you can reach the Fiabilandia theme park. All the hotel rooms have a large balcony with sea view (on the seafront on request), independent air conditioning and heating, satellite and digital terrestrial TV, WI-FI, safe, telephone and private bathroom with open shower (shower only in some rooms). JUNIOR SUITE: completely renovated, with LCD TV on the walls, minibar, soft lighting, refined and elegant furnishings and shower cubicle. Swimming pool, garden, open-air porch with wooden floors and equipped with sofas and tables, free bicycles, TV room, bar, restaurant with sea view, lift, reading room with common newspapers, conference room for 20 people. PARKING: covered and uncovered, available for everyone. BREAKFAST: with sweet and savory dishes. LUNCH AND DINNER: à la carte menu with more choices with traditional Romagna dishes and creative menus with multiple choices of quality products and special attention to the different dietary requirements. VARIATIONS: vegetarian cuisine; vegan and celiac (both on request). In the hotel: swimming pool with low water (80 cm), indoor playground area and pediatric advice on request. At the restaurant: high chairs at the table, baby food and baby menu. On the beach: playground area, entertainment and baby / mini / junior club. The hotel has a swimming pool with a 70 square meter springboard situated in the garden and surrounded by a solarium area with sun loungers. In the tub there is a corner dedicated to children. The hotel has an agreement with Bagno n.115, a facility equipped with numerous spaces and services dedicated to adults and children. - Beverage inclusive: + € 5.00 per day per person (Water and wine with meals), Beach service not included. From May 25th to June 1st. One week all inclusive treatment by the sea. The price includes beach service and drinks at meals.